Many social work students are learning how to be professional mental health providers. How are schools assisting students who have their own mental health challenges? Anyone who has been through a BSW or MSW program can tell you it is a stressful experience. Students must balance coursework with personal obligations such as job and family responsibilities. Field work adds to students’ uncertainties of whether they are “cut out” for the profession. Many students complete the academic marathon exhausted but otherwise unscathed. But for some students, the stress can exacerbate preexisting mental health conditions or cause new ones to emerge. And while social work schools provide their students with all sorts of information about how to promote clients’ mental wellness, the mental health needs of the students themselves sometimes don’t receive the same attention. Social work educators, including professionals serving as field instructors, confronted by a student with mental health difficulties face a complex dilemma. On one hand, social work education prides itself on being inclusive and recognizes that students with mental health challenges can become effective clinicians and advocates. On the other hand, educators have an ethical duty to ensure that students who graduate from their programs can deliver high-quality services that do not harm clients. 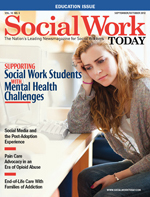 While much research has been done on the mental health needs of college students in general, relatively few articles have explored the unique experiences of social work students. These articles, as well as anecdotal evidence, reveal that some social work students face significant mental health challenges. When Gail Horton, PhD, an associate professor in the Florida Atlantic University School of Social Work, partnered with two colleagues to examine the mental health characteristics of a group of 68 undergraduate and graduate social work students, the results were concerning. Approximately 34% of the students indicated high levels of depressive symptoms and were at high risk of clinical depression, while 6% met criteria for posttraumatic stress disorder (PTSD) and 3% were highly likely to have a dissociative disorder. Nearly 37% of the students reported having suicidal thoughts at some point in their lives, and slightly more than 4% reported that they had thought of suicide recently (Horton, Diaz, & Green, 2009). • Ying (2011) studied how field work contributed to educational disequilibrium among 37 first-year and 28 second-year MSW students. The second-year students, who already were in the field, scored significantly lower on measures of sense of accomplishment than their first-year counterparts. The first-year students also scored higher on measures of self-esteem and lower on depressive symptoms. Qualitative interviews with second-year students revealed that many of them felt anxious, overwhelmed, and incompetent in the field. • A study of mental health, substance use, and coping among 416 social work students following Hurricanes Katrina and Rita found that 47% of students scored at or above clinical levels for depression, while 6% showed symptoms of PTSD and nearly 17% reported substance use (Lemieux, Plummer, Richardson, Simon, & Ai, 2010). Nearly 24% of students reported that the hurricanes reminded them of a past personal traumatic experience. • Ting (2011) examined depressive symptoms in a sample of 215 BSW students. Nearly 51% of students scored at or above the cutoff on the Center for Epidemiologic Studies Depression Scale. The 20-item instrument covers issues such as feelings of guilt, hopelessness, depressed mood, and sleep disturbance. Ting’s research also explored why some students chose not to use mental health services. The reasons provided by students included lack of time, lack of resources, lack of knowledge, confidentiality concerns, preference for informal help, and concerns about cultural competency. Of note is that nearly 23% of students training to be social workers reported that they did not seek out services because of distrust and fear of mental health professionals, while nearly 22% expressed concerns about quality of mental health services. In addition, stigma emerges as a major roadblock to students’ service seeking. Not only do students face general societal stigma against people with mental health challenges, but they also are pursuing entrance into a profession where they must demonstrate competence in helping clients with these difficulties. Many students fear that they will be perceived as weak or not ready for social work if they seek help. As one student in Ting’s study noted, “I can’t be seeking counseling or admitting I need help from mental health professionals when I am trying to become one” (p. 261). Schools of social work and social work educators are using a variety of approaches to address the mental health needs of students. One group of approaches includes policies and procedures to respond to students who are actively exhibiting mental health difficulties. In GlenMaye and Bolin’s study of social work educators nationwide (2007), approximately one-third of the 71 respondents indicated that their program had a formal policy for students with psychiatric disabilities. Other respondents indicated that their program addressed these students’ needs on a case-by-case basis. Louisiana State University (LSU) School of Social Work is one institution that has a codified review process that can be triggered when a student does not meet academic requirements, exhibits behavior judged to be unprofessional or in violation of the NASW Code of Ethics, or threatens or attempts to self-harm, among other indicators. There are three levels of review, each with increasing levels of involvement from school faculty, staff, and field educators. At the Boston University School of Social Work (BUSSW), students are expected to adhere to a set of behavioral standards focused on areas such as professional behavior, self-awareness, interpersonal skills, and self-care. Concerns that emerge are handled first through a meeting between the student and the instructor/field instructor and, if necessary, through a meeting that also includes the student’s faculty advisor. If the concern persists, then a problem resolution meeting can be called that can include the student, other students, faculty advisors, and field instructors, among others. One goal of this meeting is to create an action plan to address the concern. If the concern continues to persist, the student can be the subject of a status review committee meeting where a decision is reached concerning whether the student will be allowed to continue in the program. At least two members of the status review committee are knowledgeable about mental health issues, and the committee works to ensure that the review process is done in a manner that is as sensitive as possible, says Gail Steketee, PhD, dean and a professor at BUSSW. “We’re in the business of treating mental health with our clients, so we want to make sure that our interactions with students are as objective and confidential as possible,” she says. Many schools educate students, staff, faculty, and field educators about the mental health resources available on campus and how to connect students to these resources. Since field placements are often potential stressors, strong connections between field instructors and school faculty are especially valuable, says Mary Dallas Allen, PhD, MSW, an assistant professor at the University of Alaska Anchorage School of Social Work. Allen and Trawver recently wrote the article “Student Mental Health and Field Education: Responsibilities and Challenges of Field Educators” for The Field Educator that explores the complexities social work educators must navigate when faced with students with serious mental health challenges. In addition to formal policies and administrative approaches, some social work educators incorporate self-care and mental wellness into programming aimed at all social work students. For example, Birnbaum (2008) describes a group of social work students who participated in an eight-week mindfulness meditation group and found the experience helped them gain insight about themselves and their professional self-concept as well as regulating emotions. Another study of social work students attending a stress-management seminar (Dziegielewski, Turnage, & Roest-Marti, 2004) reported that students participating in the seminar showed significant increases in knowledge about topics such as how to reduce stressful feelings and prepare for stressful situations when compared to a control group. Sharon Moore, PhD, MSW, a professor in the Raymond A. Kent School of Social Work at the University of Louisville in Kentucky, decided to add a self-care assignment to a foundation practice class after one of her students approached her with concerns that self-care was not a formal part of the curriculum. Moore (2011) required students to keep a biweekly self-care journal to document the strategies they used to keep their emotional, physical, psychological, social, and spiritual selves healthy during the semester. Students reported that they used a variety of strategies, including taking time off from work, engaging in daily prayer and/or Bible study, exercising, and spending time with family. Additional research into the mental health of social work students could provide needed clarity to social work educators struggling with the dilemma of helping social work students with mental health challenges to access education while ensuring the protection of clients, Trawver says. Especially helpful would be large-scale studies examining students in a region or even nationwide, since most existing studies have examined only small populations of students. Educators also need to help students reframe their feelings about seeking help. Instead of seeing help-seeking behavior as a sign of weakness or incompetence, students need to be encouraged to see it as a sign of being a professional, ethical social worker, Lemieux says. Birnbaum, L. (2008). The use of mindfulness training to create an “accompanying place” for social work students. Social Work Education, 27(8), 837-852. Dziegielewski, S. F., Turnage, B., & Roest-Marti, S. (2004). Addressing stress with social work students: A controlled evaluation. Journal of Social Work Education, 40(1), 105-119. GlenMaye, L. F., & Bolin, B. (2007). Students with psychiatric disabilities: An exploratory study of program practices. Journal of Social Work Education, 43(1), 117-132. Horton, E. G., Diaz, N., & Green, D. (2009). Mental health characteristics of social work students: Implications for social work education. Social Work in Mental Health, 7(5), 458-475. Lemieux, C. M., Plummer, C. A., Richardson, R., Simon, C. E., & Ai, A. L. (2010). Mental health, substance use, and adaptive coping among social work students in the aftermath of Hurricanes Katrina and Rita. Journal of Social Work Education, 46(3), 391-410. Moore, S. E., Bledsoe, L. K., Perry, A. R., & Robinson, M. A. (2011). Social work students and self-care: A model assignment for teaching. Journal of Social Work Education, 47(3), 545-553. Ting, L. (2011). Depressive symptoms in a sample of social work students and reasons preventing students from using mental health services: An exploratory study. Journal of Social Work Education, 47(2), 253-268. Ying, Y. W. (2011). The effect of educational disequilibrium in field work on graduate social work students’ self-concept and mental health. Journal of Teaching in Social Work, 31(3), 278-294.